Continuing to drive innovation in the connected kitchen, Samsung Electronics introduced its latest edition Family Hub 2.0 refrigerator at CES 2017 in Las Vegas. 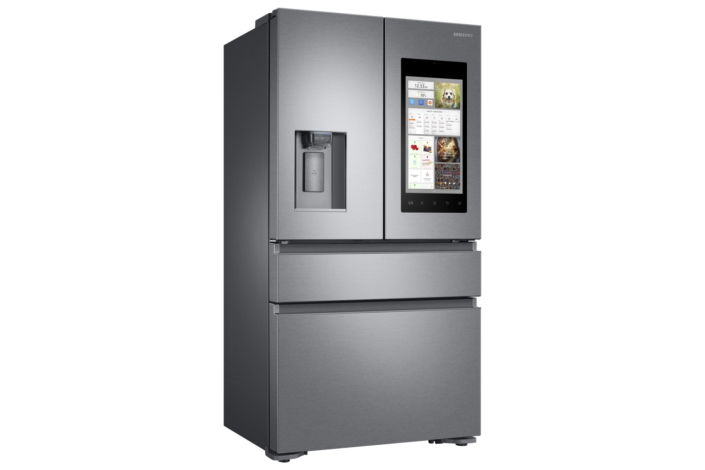 The next generation refrigerator, building upon Family Hub 1.0 which was introduced to wide acclaim last year, features expansion from four to 10 refrigerator models as well as enhanced usability with improved app integration and diverse new app partners. Additionally, signaling its expansion into new categories, Samsung also introduced its new line of smart built-in cooking appliances. Driven by the success of Family Hub, Family Hub 2.0 will be available across a full range of Samsung’s popular 3-Door and 4-Door French Door models as well as the existing 4-Door Flex lineup, allowing consumers to choose the refrigerator that best matches their household needs. With the Family Hub 2.0, usability, as well as food management, has been significantly enhanced through expanded and intuitive app integration. For example, users can determine which food items need to be replenished through the internal View Inside cameras. Images of those items can then be added to the shopping list feature, and conveniently ordered through the Groceries by MasterCard app. In addition, the Recipe app, powered by AllRecipes, features recipe readout and enlarged text to make it easier for users to multi-task in the kitchen as well as access recipe content from diverse countries around the world. The Family Hub 2.0 has also been significantly enhanced when it comes to family communication. An entirely new and easy-to-use interface has been developed to enable family members to create their own profiles using avatars or their own personal pictures. With the 21.5-inch LED touchscreen serving as an interactive digital bulletin board, family members can then, through their profiles and the Family Hub app on their smartphone1, share photos, access updated calendars, handwrite memos in real time, and post memos from wherever they may be. For a more convenient kitchen experience, Samsung’s advanced voice technology has also been integrated across many of Family Hub 2.0’s apps. For example, users can issue voice commands to learn the weather and time, add products to shopping lists and order groceries online, manage to-do-lists as well as calendar schedules, in addition to controlling various other apps. To provide further upcoming choices for food delivery and cooking, location-based safety and home security services, and entertainment offerings, Samsung is also collaborating closely with partners including Grubhub, Nomiku, Glympse, Ring, Spotify, and iHeartRadio. With the addition of new local partners, Family Hub is also winning adoption among consumers globally. For example, E-Commerce grocery shopping capabilities from grocers like EATALY and LiDL are bringing more convenience to European consumers, and Morning Brief news content provides relevant news from upday for users in Europe, NPR for users in the US, and Kakao for those in Korea. The Family Hub is a two time CES Innovation Award honoree; first with Family Hub 1.0 in 2016 and again this year in the home appliances and software/UI categories. Signaling the company’s commitment to investing in categories in which its expertise and innovation can enrich and empower the lives of consumers, Samsung also introduced its new smart built-in cooking line at CES 2017. The new product line includes various models of Built-in Double and Single Wall Ovens, Built-in Gas Cooktops, Built-in Induction Cooktops, Built-in Electric Cooktops, and Built-in Range Hoods, all of which seamlessly merge into any new kitchen design or remodel. The Built-in Double Wall Oven incorporates Samsung’s popular Flex Duo™ technology, enabling three distinct oven spaces that can be individually controlled with the Samsung Smart Divider. The Built-in Ovens also utilize SteamBake and SteamRoast functions for better control of taste and texture, and the new Built-in Cooktops feature some of the most powerful burners and customizable configurations on the market. The Built-in Cooktops’ new Magnetic Knob feature and Virtual Flame Technology™ also deliver precise cooking control and simplicity when it comes to cleaning. All a user needs to do is remove the knob and wipe down the surface – overcoming the tedious, and time-consuming painpoint of having to scrub away to remove grime on cooktops. All of Samsung’s built-in appliances are smart and equipped with Wi-Fi connectivity2, so users can remotely start, control and turn off their ovens, as well as monitor their cooktop and range hood from their smartphone. Finally, Bluetooth connectivity syncs the cooktop with Samsung’s range hood to automatically start the hood’s fans or lights when using the cooktop. For more, please visit Samsung’s CES booth #15006, on Level 1 of the Central Hall in the Las Vegas Convention Center from January 5-8, 2017. 1Compatible with Android and iOS devices. 2Internet or carrier connection required.